Creating a couture garment is perhaps one of the most satisfying (in the thick of it) and rewarding (after the fact) activities. It's no walk in the park, however, and requires meticulous hand-work, continuous problem-solving, and extreme patience to get past the finish line. People often ask me about the pressure of working with such expensive and often irreplaceable materials, and catering to such demanding clients. Bottom line, you have to love it (or at least be well-compensated for it!). With any type of work that's so technique-oriented, it's the ability to apply intense focus, and to also walk away at intervals, that helps you navigate through the project. Having an incredibly skilled assistant named Aris also helps! Our very own Edie Romper has a feminine take on the raglan sleeve—just with added gathers, and a shorter sleeve length compared to the more commonly seen baseball raglans. Now that you know what you're looking at, let's get into the history. It all dates back to a guy named FitzRoy James Henry Somerset, a British Army officer in the early 19th century. Among many less memorable battles, Somerset fought in Napoleon's last big battle (called the Waterloo Campaign) and received injuries to his right arm that led to amputation. Considering what medicinal methods must have been at that time in history, it's remarkable that he lived through the trauma to share what was to be the general's major gift to fashion—now, that's one sentence I never thought I'd pen. (Fun fact: According to Wikipedia lore, immediately after having the arm removed, he asked for the ring his wife gave him before they took the appendage away.) Despite his disability, Somerset continued to see success as he resumed his position in Paris as secretary to the British Embassy. He was eventually named Baron Raglan (of the village Raglan in south east Wales, UK) in October of 1852, shortly after receiving the title "Master-General of the Ordnance." Sounds important, though I have not the slightest clue what that job description would include. July 29, 2014 - No Comments! The Peter Pan collar is a perfect way to pull off vintage chic without coming off too strongly. The feminine yet subtle detail on our Effie top is the perfect way to add a bit of character to your wardrobe without having to worry too much about accessorizing. Read on to learn more about where the collar originated and how to best style the sweet detail so it shines. Where Did the Peter Pan Collar Come From? It should come as no surprise that the first Peter Pan collar came from a costume designed for the play that inspired its namesake—"Peter and Wendy." 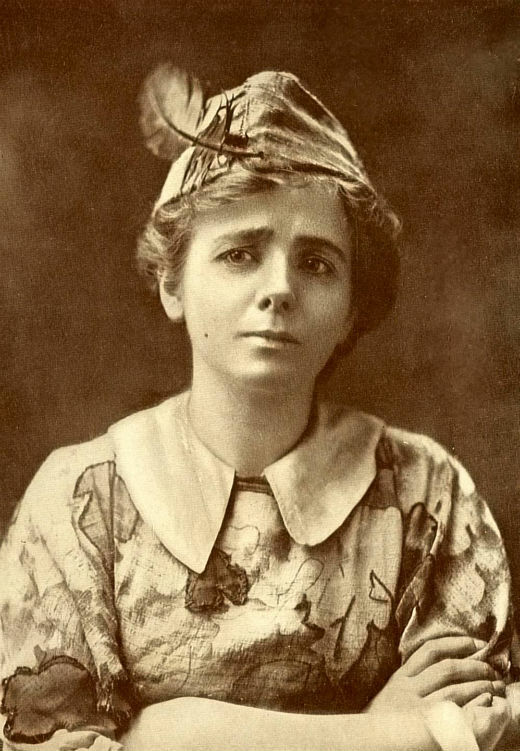 In 1905, actress Maude Adams christened the now popular style in her role as Peter Pan in her performance in New York City. John White Alexander designed the first style, and although he is most well-known for his keen eye for portraiture, we think it's safe to say his solo contribution to the world of fashion was spot-on. Surprisingly, the collar wasn't as popular among later Peter Pan characters—you don't see another performer boasting the style on-stage quite like Adams did. Maude Adams and the original Peter Pan collar, which is a much more pronounced shape than we're used to seeing with more modern takes on the classic detail. The design itself pulls inspiration from a few earlier styles, most notably the Parisian Claudine collar. Coincidentally, the Claudine's moniker also has a literary background. 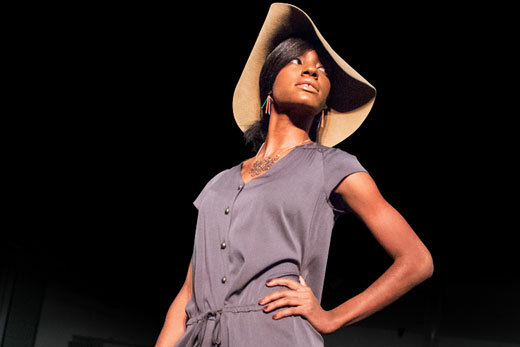 The style is named after the 1900 novel Claudine à l'école in which the main character donned the eye-catching neckline. More modern takes on the Peter Pan collar are a bit more refined—cutting down on the tails in the front and rounding the edges in a bit—making them easier to wear with lots of different styles. For those of you interested in the construction, this collar can be designed two different ways: in one piece with a front-fastening bodice or in two separate parts that are fastened in the back. Our Peter Pan collar takes the subtle, rounded shape of the Claudine and mixes it with the flair of a classic Peter Pan shape. It's delicate and feminine without taking over your outfit's entire style. The rounded neckline can be buttoned all the way up without looking too uptight, and the top two buttons can be comfortable undone to show off just the right amount of décolleté. 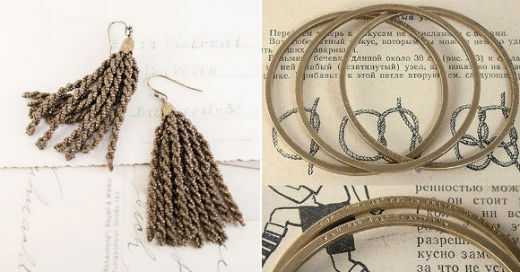 These Victorian Brass Beaded Tassel earrings and Word Up bangles from Erica Weiner are great examples of how to compliment your Peter Pan collar. Effie's buttons have a brass finish, giving you a touch of style without having to do a thing. Everyone has their own beliefs about matching metals with jewelry, but there's no real rule. Since your neckline is taken care of with the sweet rounded collar, try playing up your earrings with a pair that dangles —we suggest a jazzy brass variety. Don't be afraid to toss in a cuff or a bracelet. We suggest checking out what Erica Weiner has to offer. A lot of her pieces come with a story, which is the perfect combination to add to your newfound knowledge of the Peter Pan collar.